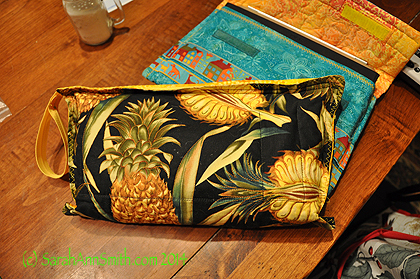 Art and Quilting in Camden and Hope » Blog Archive » Bloghop — Inside-Out in Quilting Arts Gifts 2014! 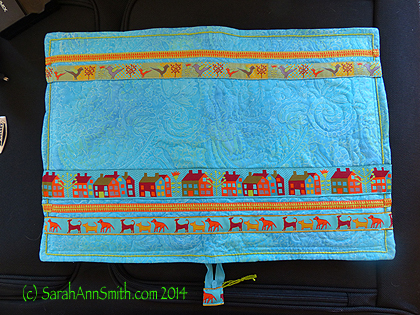 Bloghop — Inside-Out in Quilting Arts Gifts 2014! 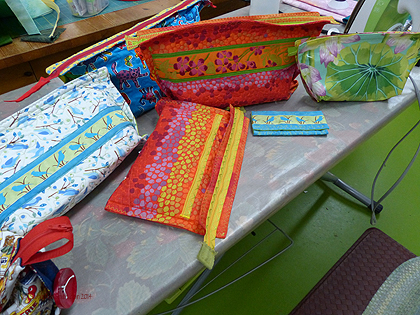 These are some of the bags you’ll see on my Inside-Out bag segment. 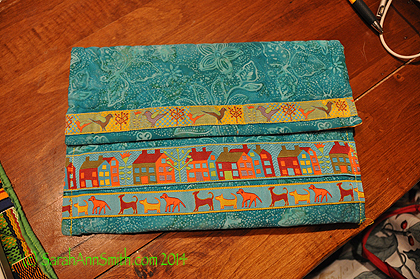 The orange bags are one of my two projects in Quilting Arts Gifts 2014 along with a companion card holder. The one on the right (the lotus fabric) is made from plasticized cloth, so great for make-up or messy stuff. 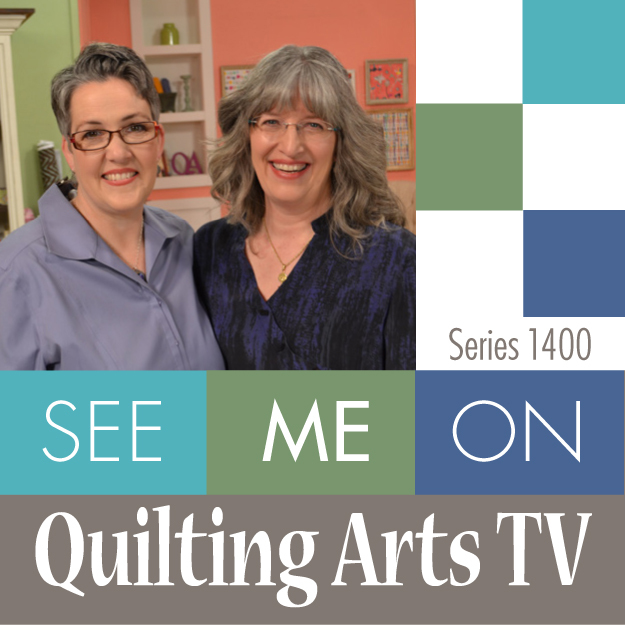 What fun I had on the set of Quilting Arts TV filming my episodes, and what MORE fun to have two projects included in this year’s Gifts 2014 magazine as well as two holiday recipes–one for a sweet treat the other is satsuma-currant scones (satsumas are similar to clementines or mandarins, use whatever citrus you have!). Makes me hungry just thinking about them! 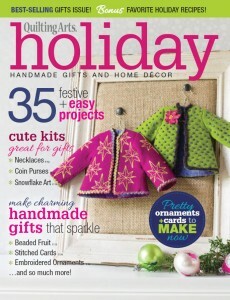 This year’s issue of Quilting Arts Gifts. I’m thrilled to have two projects and two recipes included! I thought I’d share some variations on the theme to give you ideas of how you can make your own bags–they are SO fast and easy and fun! Use the article in Quilting Arts Holiday or the instructions in episode 1402 of Quilting Arts TV to make the bag with these variations. Learn more about all of series 1400 here including information about Episode 1402 which includes the bag project. 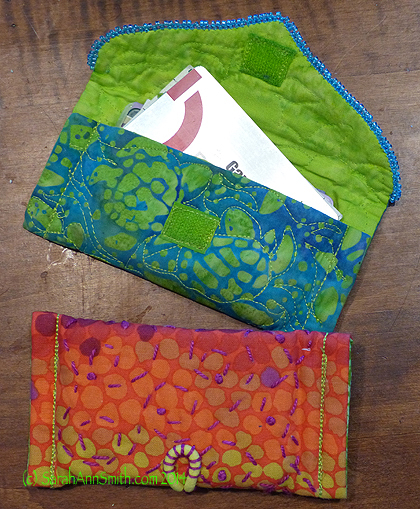 Here are two of my cardholders. These are so fast–they would make a great gift-card “wrapping” for Christmas, then the recipient can continue to use the holder. They are sized to fit business cards, but I use the green one for all those extra (annoying!) store cards for the grocery, discount stores, pharmacy, and so on. The green was the original; despite being beaded on the flap and used heavily for three years, it is still in great condition. The warm-tones bag is new. The project in the magazine uses a snap closure, but I really like this one which uses a heavy duty hair elastic and button. The blue-green card holder has velcro closing. I painted white velcro with acrylic ink to match. The warm-tones uses that thick hair elastic. I like the way I used perle cotton to quilt the bag and stitch down the back end of the hair elastic. 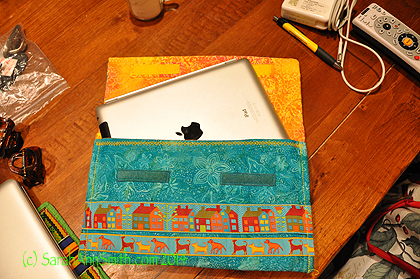 I’ve also made variations on the basic flat-bottomed bag for my iPad and notebooks. The iPad case is simply a larger version of the card holder. The trim comes from Renaissance Ribbons. And the inside. Again, I used acrylic inks to color the white velcro to match. I’m not sure that the ink is washfast, but so far I haven’t had to find out the hard way! This bag has an outside pocket (with zipper) on the back to hold the charging stuff and stylus. 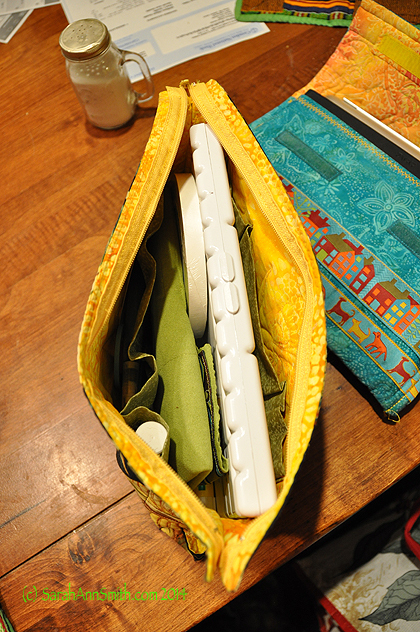 I made this bag to fit my new, slightly longer, portable watercolor palette and painting supplies. Inside of my Painting stuff bag. It has pockets sized to fit a tube of gouache, a glue stick, eraser, and so on. I’ve also made several notebook or sketchbook covers using this easy technique. My notebook, zipped closed. Can you tell I really love that ribbon from Renaissance Ribbons? I also couched some heavy perle cotton on the edge and used it as a zipper pull. The notebook cover opened up. 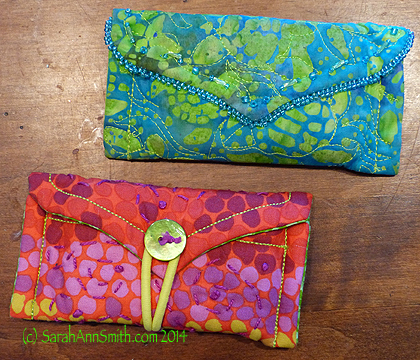 I make pencil pockets on the left and used a 22-24 inch zipper all the way around. When gauging the size for your cover, think about the thickness of the zipper tape. If your notebook is really thick, you may want to add some fabric extensions to the sides so it will close nicely OR just make the cover a bit larger than you think you’ll need so it will wrap and zip shut nicely. And you can see in the center how I had fun quilting AND used a small bit of ribbon at the top ends of the zipper and at the bottom to make a nice, clean finish. My notebook cover, opened up, shows the ribbon extends across the back, too. 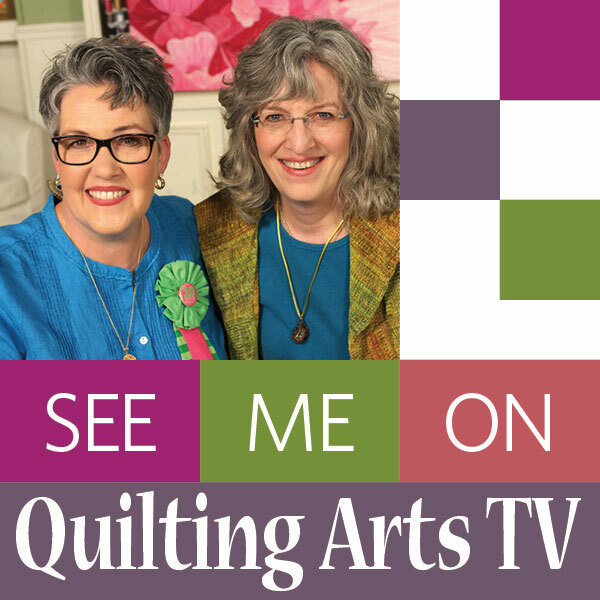 I hope you’ve enjoyed these additional options for the patterns I shared in my Quilting Arts TV segment and in QA Holidays 2014! Remember to use the link on the left if you decide to go shopping at the online Interweave Store–it may get you some discounts! 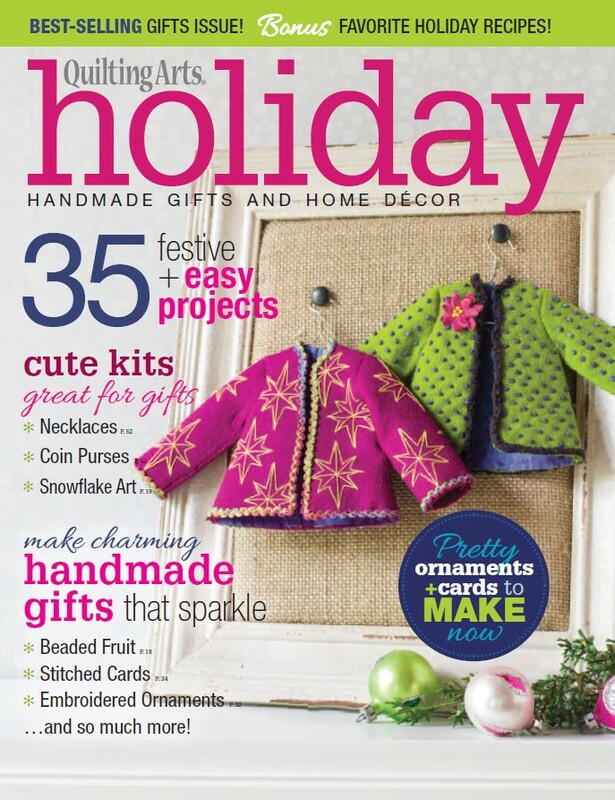 Or click on this one right here to go directly to the Holiday issue! Here’s the list of the bloghoppers with links. If you haven’t had a chance to visit already, please do. Some of these folks I know, but others are new to me so I’m really looking forward to seeing (or have really enjoyed seeing)g their blogposts and blogs! 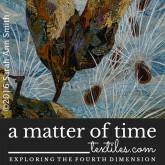 This entry was posted on Saturday, September 20th, 2014 at 6:20 am	and is filed under art quilting, Blogging, Fun stuff, Holidays, In a magazine!, Interweave-Quilting Arts, Machine Quilting, Published!, Quilting Arts / Interweave, Techniques. You can follow any responses to this entry through the RSS 2.0 feed. Both comments and pings are currently closed. I love the bags. So many ideas and so many uses. My favorite is the journal cover. I love your fabric choices and the bags. I may need to make a journal cover. All of your things are very neat! All of your bags are stunning! Love the bright, happy colored fabrics you used. Painting white velcro with acrylic ink to match your fabric is a brilliant idea! I love all of these, especially the card holders. Each of your bags is a work of art! I can’t wait to see the new shows with Susan and you, and I love saving them so I can watch at my leisure. 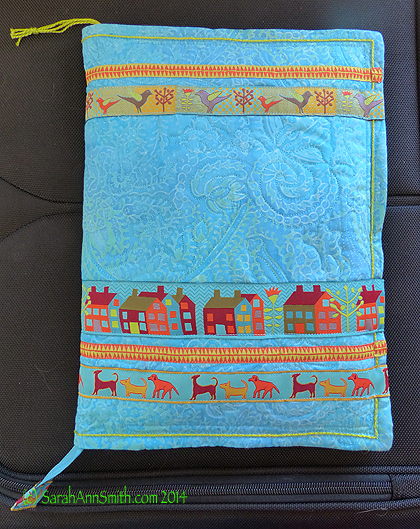 Love the cases and I like the idea of making some iPad cases for family and friends. Love the use of the ribbons on your bags. I love all of these bags & covers. 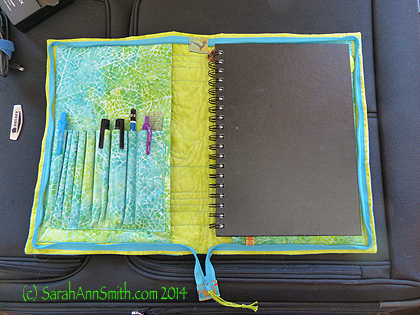 The zipped notebook holder is wonderful will the slots for pens / pencils! Lots of great ideas. Can’t wait to get my hands on this magazine!